The winter Milky Way runs between the two celestial dogs, Canis Major and Canis Minor. These dog constellations make faithful sky companions for winter skywatchers. If you're a skywatcher and a dog lover, then a special celestial treat is in store for you this week. Most stargazers are familiar with the figure of Orion the hunter, with his crosswise belt and jeweled sword. Less familiar are the figures around him. Like any good hunter, he's accompanied by his two faithful hunting dogs, large and small. The large dog, Canis Major, is a truly impressive beast. Find him by following Orion's belt down and to the left. Sirius, the brightest star in the sky, marks the dog's head. Stars may be bright for two reasons; they may be inherently bright, in which case they may shine over vast distances. Or, like Sirius, they may be fairly ordinary stars which are bright solely because they are close to us. Below Sirius, a triangle of bright stars marks the dog's hips and hind paws. Close by is a dim star, not quite visible to the naked eye, called VY Canis Majoris. This is the largest star that we know of, a red giant larger even than Betelgeuse in Orion, and, like Betelgeuse, is a very likely candidate to explode as a supernova in the near future. The Milky Way runs through Canis Major, so this constellation is rich in open clusters, and is well worth an exploration with binoculars. 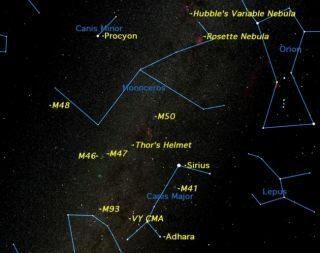 Look especially for the large open cluster Messier 41, sometimes called "the little beehive" in reference to the Beehive cluster in the constellation of Cancer. Another fine cluster nearby is Messier 93, in the neighboring constellation of Puppis. Well above Canis Major, on a level with Orion's shoulders, is the small dog, Canis Minor. This is a tiny constellation, consisting of only two bright stars, more like a "hot dog" than a real dog. The gem of Canis Minor is the bright star Procyon. Like Sirius, it is bright because it is relatively close, at11.4 light-years away. This makes it the 22nd nearest star to Earth. In between the two dogs is a vast area with very few bright stars, but since the Milky Way runs through it, the area is extremely rich in open star clusters and gaseous nebulas. Many of these are fine sights in binoculars and small telescopes. The famous French astronomer Charles Messier recorded three especially fine clusters here: M46, M47, and M50. In the 18th century, Messier created a catalog of objects in the sky that is still used today. Take a close look at M46 with a telescope. Hidden amongst its stars is a tiny puffball: the planetary nebula NGC2348, which is the last gasp of a dying star. Like much of the Milky Way, this region has more than its share of gaseous nebulas, which are vast clouds of glowing gas from which new stars are forming. One of the most famous is NGC2359, sometimes called "Thor's Helmet," because of its resemblance to a Viking helmet. If you are blessed with a very dark sky, use binoculars to look for the Rosette Nebula, or NGC2237. This object is a popular target for astrophotographers, but is a difficult object to observe visually because of its large size and dimness. But, on a dark night with 7x50 or 10x50 binoculars, it can be seen glowing faintly, twice the diameter of the full moon, with a beautiful open cluster at its heart.